Dog Boarding. Meadowsweet Pet Boarding and Care. 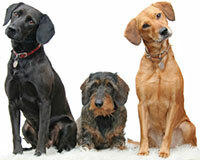 Wilmington, N. C. 910/791-6421 Loving care for dogs, cats, birds, and other small pets. Our canine facility features climate controlled 12' x 6' runs and 6' x 4' runs with raised comfort flooring. Raised comfort flooring is a soft wire wrapped flooring system that keeps your dog's paws off the concrete floor. Indoor/outdoor runs are also available. Our indoor/outdoor runs feature the same raised comfort flooring. An indoor/outdoor run allows your pet the choice of outdoor access or an indoor area that is heated and cooled. We also offer large cages as an additional boarding option for small dogs and puppies. For the health and well being of your pets, and others, and others MeadowSweet requires that all appropriate immunizations are current. All dogs are taken to outside graveled courtyard runs in the morning and in the evening for approximately one hour each time. MeadowSweet has 7 large exercise yards for our canine guests. You may purchase exercise time in the yards for an additional fee. An exercise session includes a minimum of 20 minutes of exercise time. Only dogs from the same family are allowed to exercise in a yard together. While you pet stays with us he or she can enjoy a can enjoy a kennel bath. Kennel baths are available Sunday through Friday and include shampoo and rinse, nail trim, and ear cleaning. Pets departing on Saturday can be bathed on Friday. Bath prices vary depending on the size of the dog and coat type.